Free Shipping Included! 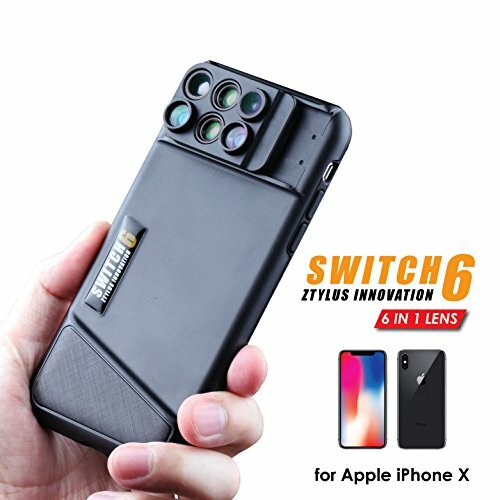 Ztylus Switch 6 for Apple iPhone X: 6 in 1 Dual Optics Lens System (Fisheye, Telephoto, Wide-angle, Macro and Super Macro), Double Layer Protection (Black) by Ztylus at Got Busted Mobile. MPN: 850104007524. Hurry! Limited time offer. Offer valid only while supplies last. MULTIPLE DUAL LENS OPTIONS: Greatly extend your optical zoom range and capture a variety of shots that you couldn't achieve with just your phone. The Switch 6 Lens Kit includes a 120° Wide-Angle, 2X Telephoto, 10X Macro*, 20X Super Macro* and 180° Fisheye Lens. *With a focusing distance of 18mm, get incredibly close to your subject until it comes into focus. LIGHTWEIGHT & ULTRA-PORTABLE: Weighing in at only 2 ounces, you'll barely notice the case on your phone. The slim and streamlined case is just 11mm, adding minimal thickness to your phone. ALL AROUND DOUBLE LAYER PROTECTION: The Switch 6 Kit offers all around double layer protection for bumps and scratches and the raised lip protects your screen when setting the phone face down. The cutouts allow for full functionality of all the ports and buttons.